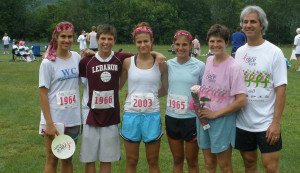 Bill & Ruth Cioffredi with their four children at the 2008 Race for the Cure. An event they participate in annually. Bill Cioffredi grew up in Rutland, Vermont and graduated from the University of Pennsylvania in 1979. While there he received a degree in Physical Therapy and lettered in varsity football. He began his professional career at Dartmouth-Hitchcock Medical Center right out of school. While there he designed a senior physical therapy position to specialize in the treatment of orthopedic conditions. While at DHMC he met Ruth Curtis, an Occupational Therapist specializing in hand rehabilitation. Ruth is an early member of the American Society of Hand Therapists, and was involved in the development of the first multidisciplinary orthopaedic Hand Clinic at DHMC. 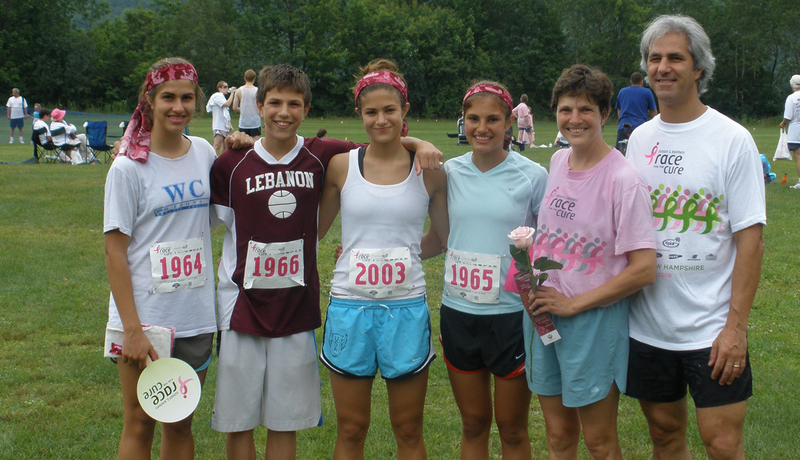 In 1985 Bill and Ruth married, and established the Cioffredi Orthopaedic & Sports Therapy Center. Originally, the practice was open part-time with Bill as the sole provider. In the initial years, Bill’s intention was to maintain a simple, small office. As his case load grew, he brought on additional staff to meet demand and maintain his policy of immediate access; and so we became Cioffredi & Associates. For the first 28 years of our practice, our focus was on the delivery of excellent PT and OT services. The organization moved three times during that period, each time to secure a larger and more efficient space. In January of 2014 we relocated to our current location on Etna Road which was selected for the openness of the space as well as the exposure to the outdoors. We felt this location would provide an inspiring and healthy environment in which to care for our clients. With the move we established The Institute for Health and Human Performance, again expanding our offerings to include Medically-Based Personal Training, Massage Therapy, Health Coaching, and Nutrition Counseling. These services were added both to complement our PT and OT program, and to provide our clients the potential to optimize their health. This program is unique in that it allows for the coordination of services, as well as collaboration between providers across disciplines. Part of our mission with the formation of the Institute was to provide a venue for educational events and speakers. These events, held throughout the year, are generally free and open to the public. In 2018, Cioffredi & Associates expanded to a second PT clinic in Grantham, NH to support a community in need of our services. Today, Cioffredi & Associates has a team of 27 dedicated staff to help our clients achieve their goals. Our clinical staff are skilled in the evaluation and treatment of muscle and joint problems as well as neurological disorders. Many have advanced certifications in specialized areas of rehabilitation including: Orthopaedic Clinical Specialist (OCS), Mechanical Diagnosis and Treatment of the Spine (MDT, McKenzie), Dry Needling, and the Graston® Technique. As a company we are committed to education, and have earned a strong reputation as a clinical training site for doctoral level physical therapy students. In addition, we offer a mentorship program for our clinical staff to support the highest levels of current practice within the profession. Our philosophy lies in a one-on-one treatment approach, using a variety of techniques to provide care specific to the individual. We are still committed to providing clients with immediate access, and most clients are offered an appointment time within 24-48 hours of calling. We are currently treating from 7am to 7pm which offers convenience to those with busy schedules. From rehabilitation to health improvement and performance enhancement, our team of experts are here to help you achieve your goals.